In the last few years we have bared witnessed to shocking incidents of manic and out of control behaviour from the onslaught of stampeding shoppers as the shutters are pulled up in the early morning of Black Friday. Imported from the US and now a time-honoured tradition across Europe, thousands go to the extremes by queuing overnight or even for days sheltering roadside in tents determined to be the first through the doors to grab the deals and discounts on offer. Black Friday encapsulates modern rush for profit, but these darker scenes reveal the damaging behaviour by the dominant firms. As well as forcing out smaller independent competitors, the major maker players have been criticised for their questionable record on working conditions, contributing to climate change and giving fuel to the global fire of inequality. 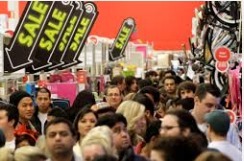 So, if you are also shocked with this phenomenon, there’s something you can do; take part in Buy Nothing Day. Born in Canada 23 years ago from a movement fighting the growth of consumerism, it has now spread to over 60 countries worldwide. Rather than hurrying to the closest shopping centre, participants of the movement keep their wallets firmly in their pockets on Black Friday, in protest against mass consumerism, waste and debt. Buy Nothing Day grows each year raising our awareness of ethical shopping, through initiatives that guarantee fair prices to the producers and adequate working conditions for the manufacturers, as well as projects that encourage buying locally-sourced products. And don’t forget: that goes for the rest of the 364 days of the year!